What is it about car keys, money clips and mobile phones that make them tend to wander off? Almost every week I mount a major search-and-rescue mission to find some small item that has gone missing. TrackerPad can put an end to that problem. It’s a small waterproof transmitter, about the size of a British ten pence or a US quarter, with a sticky surface that can be attached to almost anything. Once the TrackPad is charged and deployed, it’s location can be tracked using a smartphone app. The pads contain a built-in SIM that communicates through the TrackerPad server to a user’s phone and app. No cellular service, WiFi or Bluetooth is required and there’s no service plan. 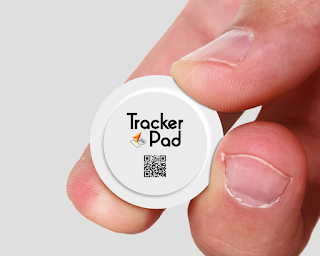 TrackerPads can be tucked away in a wallet or stuck to a larger item such as car, bicycle, motorcycle or pet. You might also give one to your a teenager before they head out for the evening. TrackerPad supports geo-fencing so you can be notified if it strays beyond a boundary that you set. TrackerPad is seeking $155,194 through a Kickstarter campaign where backers who 30 (about $47 US) will receive 2 TrackerPads, a USB charging bay and information about downloading the app. Estimated delivery is December, 2015.